When you are a parent and faced with the reality that your children are doing things like running for student government, logging into their own gmail accounts,and you know…growing up, there suddenly seems to be an emotional land mine buried in every nook of the house. Phoebe’s purple velvet first birthday dress — the one Andy bought for her at Saks in 2003 — hung in the closet for five years longer than she could squeeze a toe into it because I couldn’t bear to stash it in some basement box that probably won’t be opened until Phoebe herself is a mom. The thought of tossing Abby’s “portfolio” of artwork from preschool — even though I haven’t opened it once in three years to admire the work — fills me with dread. And the books! Don’t get me started on the books. If they weren’t threatening to take over the living space in our house, Moo Moo Brown Cow would still be on our TV room coffee table and I would still be telling anyone who would listen: This is the book we were reading when Phoebe said her first word! No, I can’t ignore the books. The only thing I can do to make myself feel better about getting rid of them is give them to my brother, whose son is only 4, and who still has thirteen glorious Lemony Snicket books to look forward to reading. (Where is the justice in life?) “It’s like your birthday!” my brother says to my nephew every time we do the hand-off. Nathan will grab How Do Dinosaurs Say Goodnight, and I will go into lock-down mode. If Auntie Jenny allows herself to remember reading that one to Abby, Auntie Jenny just might lose it. So “Fave Five,” a new series on DALS, is, in part, my selfish attempt to hold on to my daughters’ childhoods — sorry, I mean my daughters’ childhood books that have meant something to our family long after they are no longer in the reading rotation. The series will also give us a chance to write about whatever books happen to making the house happy but don’t seem to fit into one of Andy’s or Phoebe’s epic round-ups. (Expect a lot more of those, too.) The books we choose could be old favorites, they could be new favorites — hell, we might even throw in a game or toy or video or two. Put it this way: If I get that twisty, dark pit in my stomach when I think about handing it off to my nephew, you’ll probably be reading about it here. And don’t worry, you won’t have to read my sob stories every time you check in. Just click the little button on the right column (right near the Categories list) and it will immediately take you to the latest picks. They will be changing regularly, so check back often. “Fave Five” logo designed by Robin Helman. Thanks Robin! I couldn’t be happier about the inclusion of regular book recommendations on a blog I’m already crazy about! FUN FUN FUN! You probably already can guess about my own unreasonable obsession with children’s books, tee hee — so I’m thrilled to come read about yours! I always love it when you guys “talk book”! Kids books and food in one blog = unbeatable. Total good times! It is also really swell to know that I am not alone in my inability to part with my children’s books. Thanks. My kids have long outgrown their board books and moved on to storybooks and chapter books. I considered donating them or giving them to a friend. But what if some day, a lone toddler just happened to end up at my home and really, really needed to hear Goodnight Moon? And I had given it away? The horror. Anyway, that’s what I tell myself. I sooo know what you mean. I just donated a few books but I couldn’t let go I packed them away for my grand children that are not even born yet. Eddie is obsessed with the Bone books now, thanks to you! My kids aren’t as old as yours yet, but I love these posts and can’t wait to introduce them to these picks down the road….Ditto what Krystal said. 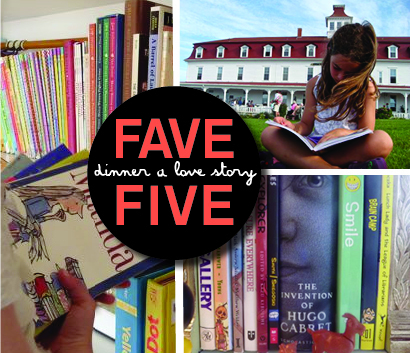 Kristin – Fave Five will include a lot of books for babies and toddlers. (If you click over to the current list you’ll see there are a few on there already.) So in other words, I’m hoping that these posts are for people exactly like you. I can’t find the list??! We’ve also done Harry Potter and Anne of Green Gables. I love this idea! I keep meaning to do a book purge with my kids’ books… but I keep procrastinating. Part of it is that they both just recently learned to read on their own, so I’m thinking maybe keeping some of the “baby” books will be worth it for them to read by themselves now? In other words, I’ll always find an excuse to hold on to them. I can’t wait to see what books you put up – I love good book suggestions!! How often are you going to change the books? Is there a way to be notified when it’s updated?